Hyperbaric Technologies "Chamberlite" Collapsible Chamber - can be stored with all accessories in the gray case in the bckground. Case is "airlift proof." 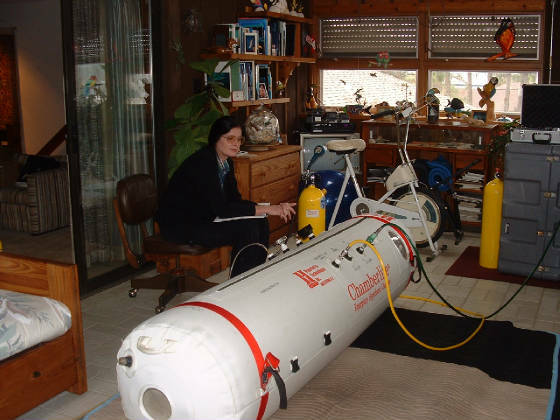 I have operated this chamber hundreds of hours at 2 ATA using it quite successfully for treatments for other people. It is exceptionally strong, and operates well even at 3 ATA, but I have had fewer requirement for 3 ATA pressurization. When I do, however, this chamber will handle it without a problem based on my extensive operating experience and emperical data to date. Oxygen Hookup with Backup Plumbing. 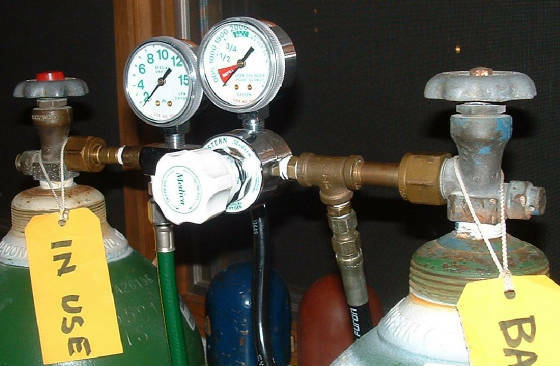 All plumbing must be capable of greater than working pressure of 2,500 psi - not what you get at the local hardware store. Donna operating chamber. 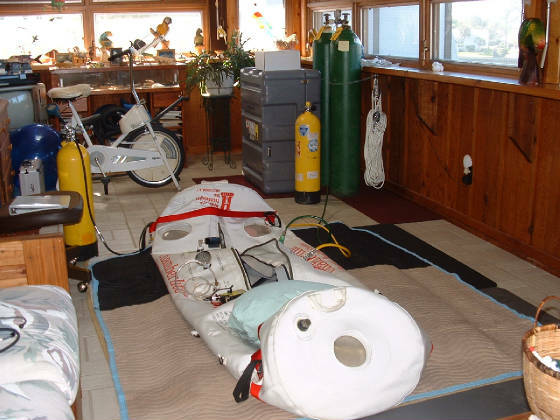 Note extensive instrumentation in front of Donna attached to the chamber and much more in front of her on the floor. This is not for the "macho know-it-all" nor for the guy who knows just enough to be dangerous. You can inflict grave harm on or kill a patient if you don't know what you are doing. Education and familiarization are absolutely imperative. If you don't thoroughly understand the gas laws and the physiology of the interaction of those laws on the human body, and if you don't thoroughly understand the workings of HBOT, then get someone who does!!! Whatever you do, DON'T SCREW IT UP AND DO MORE HARM TO THE PATIENT !! !